Try making this fun, delicious Monster Cookie Dough Fudge for the holidays this year! 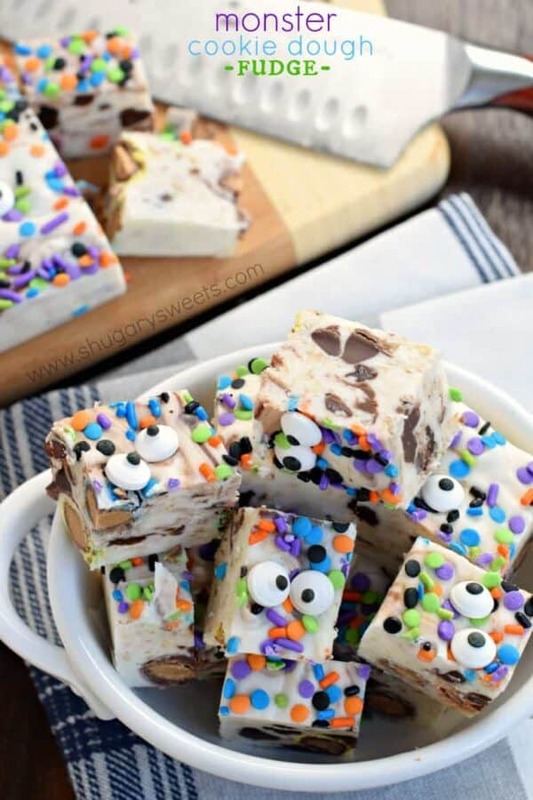 For an extra spooky look, add the candy eyeballs. Yep. Here I am with yet another fun Halloween recipe. This one though can be made any time of year. Use regular sprinkles and skip the eyeballs. It’s still going to taste amazing. It is Monster Cookie Dough after all. I may or may not have a little obsession with Monster Cookies this week. How can you not love the flavors packed into one treat?? And today’s fudge is no exception. 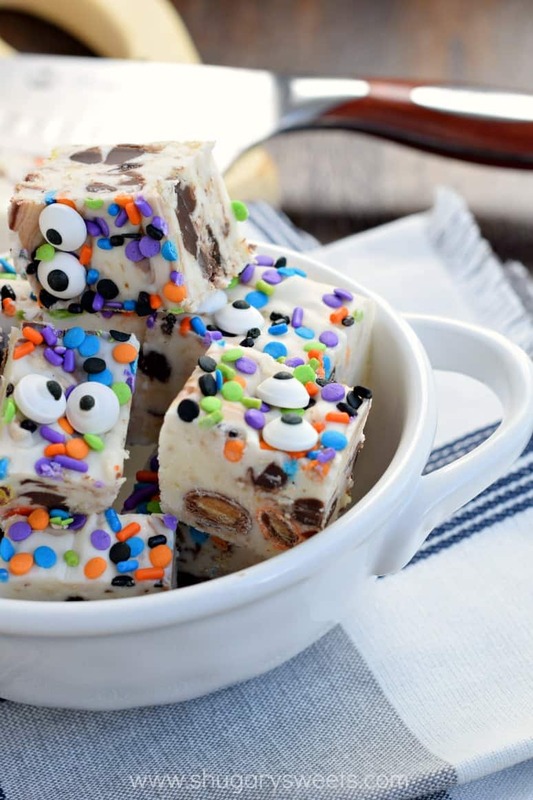 Chocolate, oats, raisins, M&M’S Peanut Butter all packed into this crazy fun fudge recipe! Know what else is fun? This new personalized Santoku Chef Knife from Life Long Cutlery! I’m not only loving that they personalized the blade with my blog design…but the handle also has my name! This knife would make a great gift for a new couple for their wedding shower…or for anyone who loves to be in the kitchen this Christmas! If you don’t own a good knife, go buy one today. Seriously, they can be life changing. You’ll wonder why you struggled sawing back and forth when you could have a gorgeous knife like this that cuts through food with very little effort! Usually with fudge that’s been refrigerated for 4 hours, I need to put my weight behind the knife and warm it under hot water. 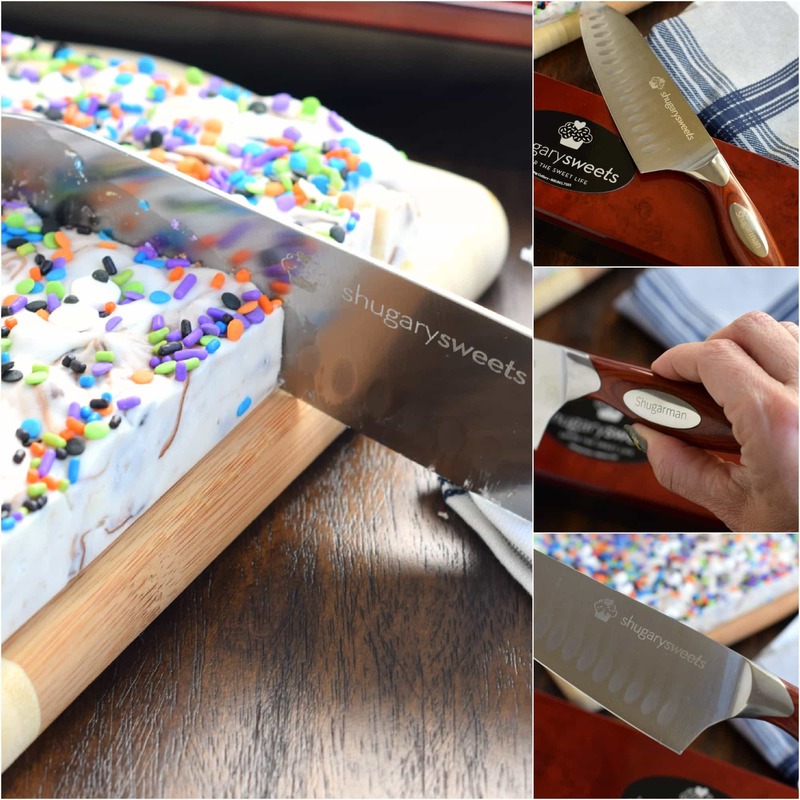 This beautiful knife sliced right through that cold fudge with no problems! Best part of these knives? It’s in the name. LIFE LONG. These knives have a lifetime warranty! And please, for the love of all things precious…do NOT put your knife in the dishwasher. The extreme heat and harsh detergents can ruin your new knife. Let’s talk about this fudge quick. 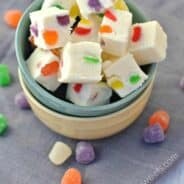 It’s made using my favorite no thermometer needed vanilla fudge base. Just more proof that knowing how to make vanilla fudge will get you far in life. I’ve added in some raisins, chocolate chips and quick cook oats to imitate the flavor profile of monster cookies. I also used my favorite flavor M&M’S. The peanut butter ones! If you just use regular M&M’S in this recipe, add in about 1/4 cup creamy peanut butter to the mixing bowl. You need a little PB kick! As for the sprinkles and googly eyes. This recipe can be made any time of year. Skip the googly eyes and add Christmas sprinkles for a fun holiday treat. Or red, white and blue. Or Valentines Day. It’s all in the color of sprinkles. ENJOY! Add marshmallow cream, white chocolate chips, and oats to a large mixing bowl. Set aside. In a large saucepan, combine sugar, cream, butter and salt. Bring to a boil over medium high heat, stirring frequently. Boil for 4 minutes, stirring constantly. Pour hot mixture over ingredients in the mixing bowl. Beat fudge mixture for about 1 minutes until white chocolate is melted and mixture is smooth. Fold in chocolate chips, M&M'S, and raisins. Pour into prepared dish. Sprinkle immediately with colorful sprinkles (for any holiday). Add candy googly eyes if desired. Refrigerate for about 4 hours until set. Cut and enjoy! 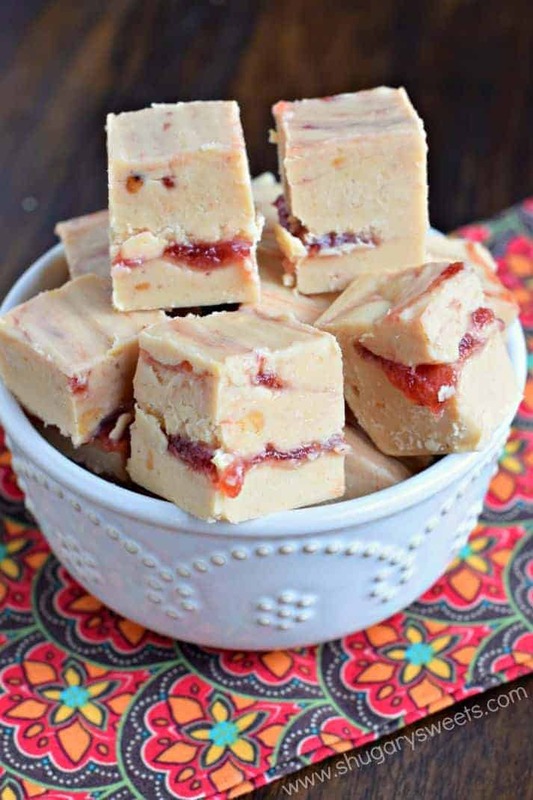 Peanut Butter and Jelly Fudge: a classic sandwich is now an easy, delicious fudge recipe! 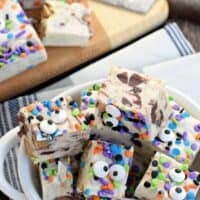 Rice Krispie Treat Fudge: combining my favorite dessert (Krispie Treats) with fudge was a glorious decision! 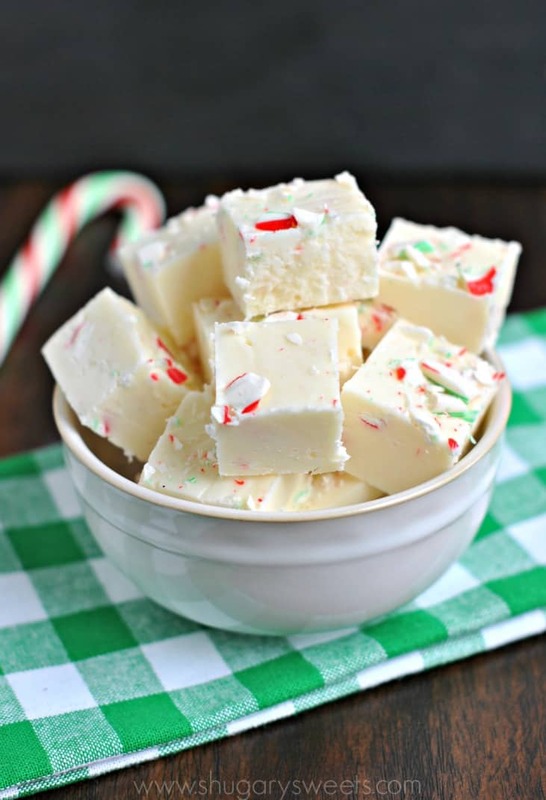 Peppermint Candy Fudge: a simple, yet festive treat to add to your dessert table! 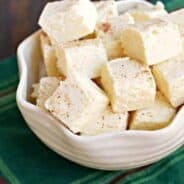 My friends make some delicious fudge recipes too!! **Shugary Sweets was given product for review. No other compensation was received. All opinions expressed are 100% my own!! A good knife is totally life-changing. Makes edges so nice and smooth! Awesome fudge, awesome knife, Aimee. Love that logo on the blade. 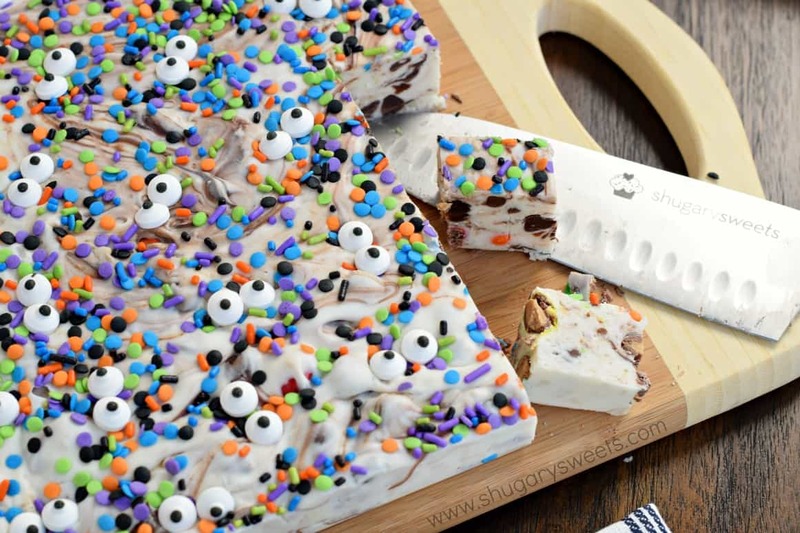 Love the googly eyes on the fudge. Too funny. My little guys will get a kick out of this. 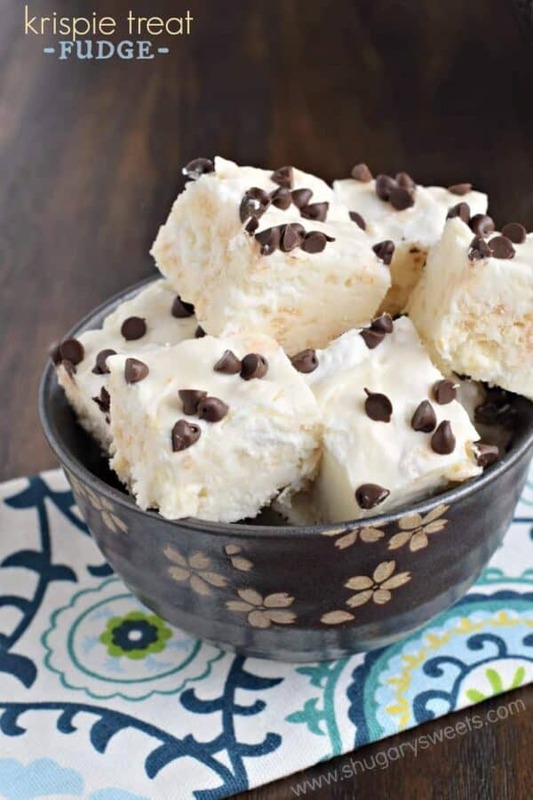 With the raisins and oatmeal, I would definitely dub this a “healthier” fudge! Such a fun Halloween treat! I love the eyes on it! Thanks so much for sharing our Caramel Apple Fudge! Aimee these are ADORABLE!! I love it! 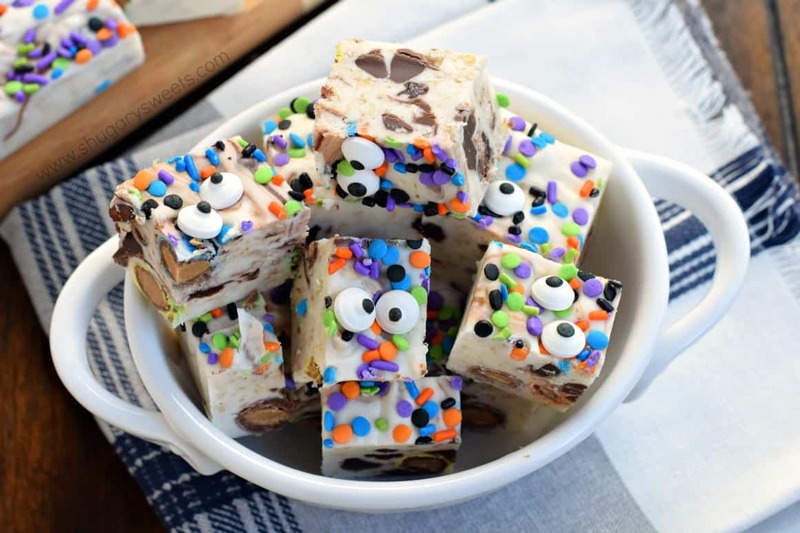 This is just about the cutest halloween treat I’ve ever seen! I can just imagine how excited kids would be to see this at a party! 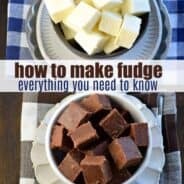 You make THE best fudge! And monster fudge?! How fun and festive. AND your name is on a knife!!! That is so cool! I’m not sure I can eat something that is staring back at me. Hehe just kidding these are so whimsical!! This is seriously the cutest fudge – ever. And who knew fudge could be cute? Love this recipe, Aimee and that knife! Fun! Fun! Fun! Love this Aimee! I just love peanut butter M&M’s…a little too much! And of course googly eyes this time of year is just a must!! !